Richardson, Garland, Sachse, Wylie, and Rowlett and surrounding areas in Collin County. Welcome. 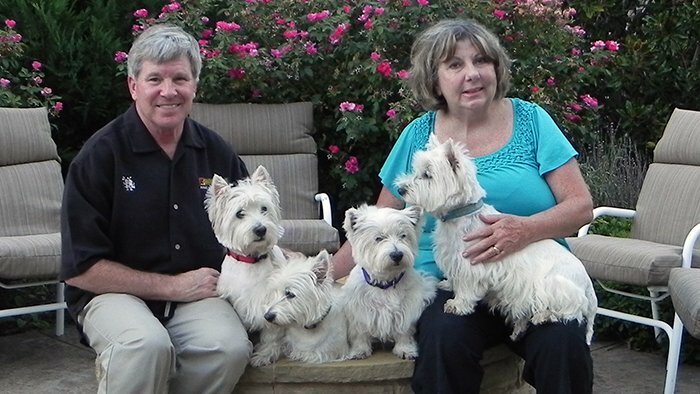 We are Dee & Jim Call and we your Bark Busters trainers for the Plano, McKinney, Rowlett & SE Collins area. Over 11 years, we have successfully trained hundreds of dogs to be well-behaved, beloved family members. Do you have a dog that has problems with barking, aggression, lunging & more? Did you recently adopt a rescue dog that you need help with? You are probably frustrated with your dog’s behavior. You might have even tried a different type of dog training method. Whatever the reason you have for needing a dog trainer, we encourage you to call Bark Busters. We truly have a unique style of trained that has been honed over 25 years and has successfully trained more than 1M dogs. We train in your home where most of the problems occur and where your dog is most focused and relaxed. It’s his “den”. We teach you to communicate with your dog in the natural way your dog communicates with other dogs – as a member of the pack. Right now your dog is vying to be the Big Dog. After our 2 – 3-hour training session, we will teach you to be the leader of the pack and your dog will start listening to your commands. You will learn to interact with your dog in a way that is easy for you to learn, and easy for your dog to understand. We only use positive training methods. The only hand you lift to your dog should be out of love. On a personal note, both Jim and I are heavily involved in the community rescuing and fostering West Highland White terriers. Too many dogs are re-homed through no fault of their own. Often, we can work with these dogs and turn them around so they make great family companions. We encounter the same types of issues many families do – aggression, sibling rivalry, & separation anxiety – but fortunately have the skills to help these dogs learn better behavior and manners! Additionally, we compete with four of our dogs in the AKC Agility trials and Barnhunt which requires very obedient dogs! Please don’t abandon your dog until you call us and we have a chance to work with you. I’m confident we can help you overcome virtually any issue so you have the well—behaved dog you have always wanted. Visit our Dog Training Plano Website. Enjoyable experience: very much so. I had no idea that we could train w/o treats or spanking. No treats, understandable & tailored to our dog. Bark Busters is practical yet successful. I highly recommend the program. Very easy to follow. We noticed imediate improvement. Very natural and easy. We recommend because it's very easy and noticed immediate improvemets.